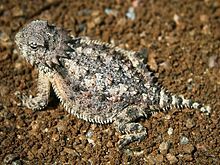 The Horned Lizard lives in dry areas and deserts of North America. The female horned lizard lays her eggs in a hole in the ground. The horned lizard eats mostly ants or other crawling insects. The horned lizard has strong armor to protect it from its enemies. It has pointed scales, as well as horns behind its head. This page was last changed on 23 January 2019, at 23:56.